This kind of thinking has earned this species a place as one of the smartest animals in the world, after humans and chimpanzees. If you want more raven facts, my book will be out before year’s end (I hope). 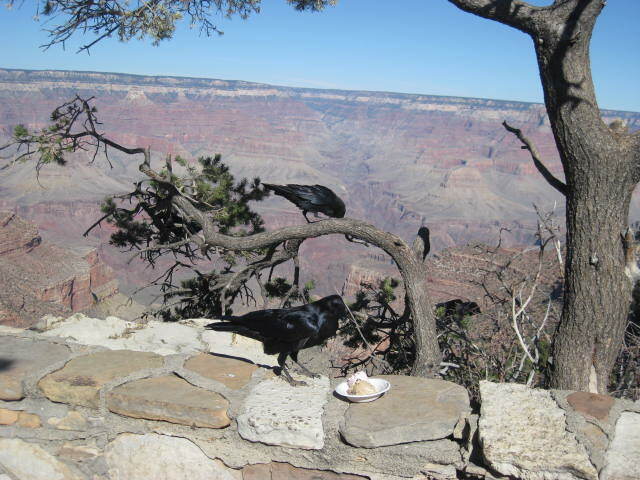 Common Ravens call the Grand Canyon home. They entertain visitors with their aerial antics and begging for food (they’ll eat anything). 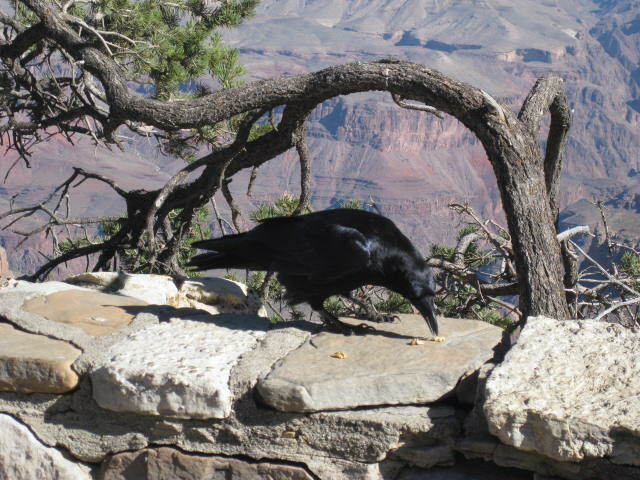 Here’s a successful hunter at the Canyon (he begged some nuts from the author). Wow, talk about Angry Birds! While we don’t see ravens in Michigan, I can only imagine how protective ravens are as the crows here don’t seem to be fearful of much of anything. So glad to hear we’ll be learning yet more about ravens very soon. Keep us posted! Having just visited Michigan, I was able to see the differences and similarities between crows and ravens. Size is certainly one of them. I’ll keep you posted on the progress in publishing my new book. Thanks for your interest. I listened to NPR story about Shade, read your blog. Kept wondering why no mention of Pepperberg? Alex? Surprised that doubt about bird IQ still exists in academic community. Guess I shouldn’t be. Pepperberg of course was at U of AZ for a number of years before her move back east. I actually visited Alex’s lab there. Surely Emily knew of her work? I know it is an uphill battle for those who wish to study avian IQ. Even now, when animal smarts are discussed, it is so frustrating that birds, perhaps the most intelligent of all animals, are frequently omitted. Even in the age of info overflow. Even after the significant studies have been validated. Birds need all the “publicity” they can get to overcome the public perception of ‘bird brain.” Thanks. Carol, you are quite right about parrots, they are even smarter than ravens (only a little bit). I know discussing bird intelligence is frustrating. Emily’s most recent research with her raven Shade demonstrated understanding of words, following directions, and even some “intentionality.” I wrote about this research in my newest book “The Un-Common Raven: one smart bird.” Visit my website http://www.uncommonraven.com to read more about these intriguing birds. Additional research has been documented by raven researcher John Mazluff at the University of Washington, so check out one of his many books. He and his students have done a great deal of research with crows that documents their ability to remember and pass down to the next generation what they learn. I am familiar with Marzluff and have some of his books. And I expect to read your book as well. Plus, I have and have read SHADE. Good job. Need to expose children to birds, bird IQ. My point was that I would expect any book that mentions an “uncommon” bird to at least reference the groundbreaking research of Pepperberg. Esp since Pepperberg was at the SAME UNIVERSITY for a time and was surely known to the “bird people” there. Emily was not the first person ever to conclude that birds are capable of remarkable accomplishments. Alex was starting to read. I try to include Alex and Pepperberg, drag them in, in any even remotely related writing I do.